OMG .. an empty scrap bin! 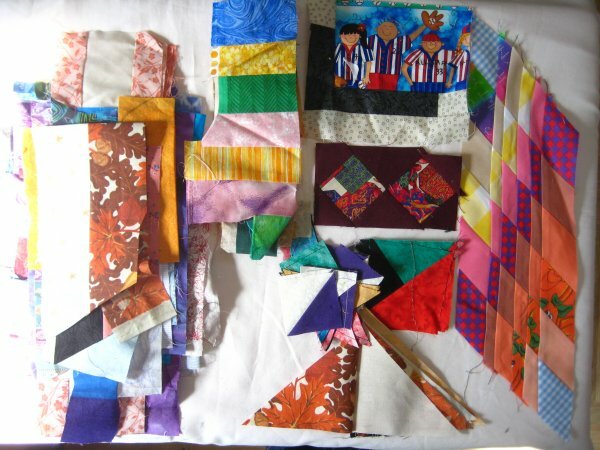 Like most quilters, I create a sizable accumulation of scraps ... leftover bits and pieces from whatever project you are working on. They are too small to use in your project but clearly too large to just literally throw away. You know they are good for something else ... mini projects, mock-ups, experimentation ... that you will *certainly* do some day. In the future. The far future. My scrap bin was over-flowing. I can tolerate a high degree of clutter but this was absolutely over the line. So, while the TV was showing something that I wasn't terribly interested in, I started sorting the scrap bin. I made piles of color-related scraps .. or mostly related. Sometimes it's a judgement call whether a scrap should go in one color pile or another. 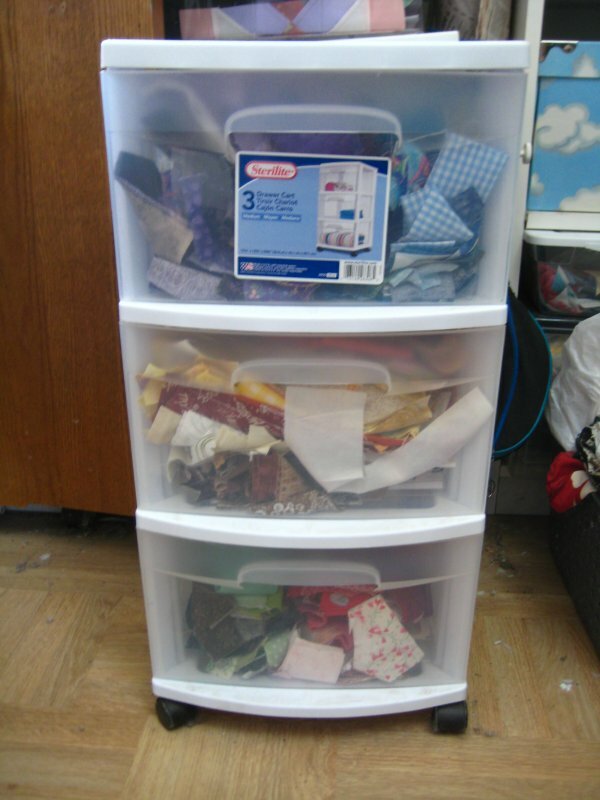 I do admit that it felt really good to finally have an empty bin and more-or-less organized scraps. where do you stash multi-color scraps? But wait! There are some scraps that defy pigeon holing. 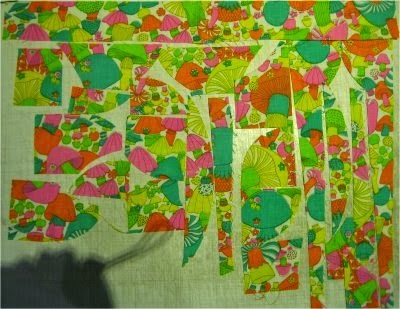 What on earth do you do with multi-color fabrics that don't have any clear, defined dominant color? I am still puzzling over this. If you have any suggestions, opinions or solutions, I'm all ears. Then there are what I call the "sewn units", These could be mock-ups, experimentation or just plain fooling around. They are also leftovers and extras from projects. I'm sure they could be incorporated into ... something. I have a couple of shoe boxes just for sewn units. And I sure haven't done anything with any of them yet. 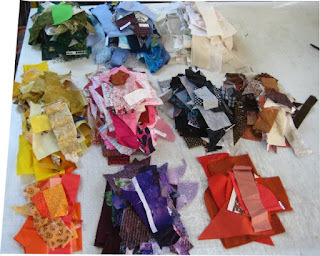 Back to the piles of scraps, now organized by color. I do have a set of drawers that I have put my color scraps in. At the time I acquired this set of drawers, I could put 2 colors in each drawer. Sadly, with the scraps I organized today, I am beyond this set. 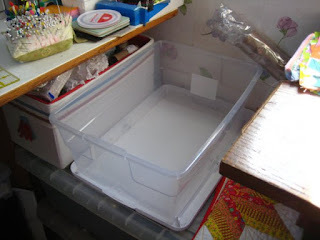 I also have No More Space in my sewing room to put another set of drawers. I'm going to need to think about this. Actually, I know what I *really* need to do is a massive clean up and reorganization of not only the sewing room in general, but the shelving units and bookcases. I need to purge myself of the items that I *know* I'm just never going to use so that I will have more space for the things that I do use. ::sigh:: This is not going to be a single afternoon endeavor. However, I'm going to do my very best Scarlett O'Hara impression and ignore what I should be doing today and will think about doing it tomorrow. For me, a "Forever Project" is always a handwork project. It is portable so that I can take it with me when I was at Little League games, doctor appointments but mostly when I was in the car on road trips or vacations. I absolutely need something to keep my hands busy and I decided long ago that although I love to read books, I wanted something to show for all that time besides having finished Yet Another Book. I recently finished my (former) latest Forever Project, which was a hand-stitched hexie 104"x116" quilt top (which you can read about here but you'll need to scroll to get to the February 2015 paragraph). 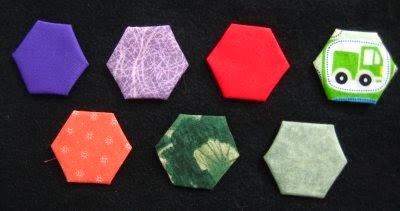 When I completed that project, I had a bunch of the small hexies leftover, such as these. I had been using them to make flower units for my (former) Forever Project, so I just kept making flower units without thinking about what I was going to use them for. It occurred to me that I *really* ought to have A Plan otherwise it was just pretty silly to be making all these cute little flower units that weren't going to be used in anything. Right about then, I came across the pattern "Reaching Out", an applique quilt pattern design by Edyta Sitar (Laundry Basket Quilts). 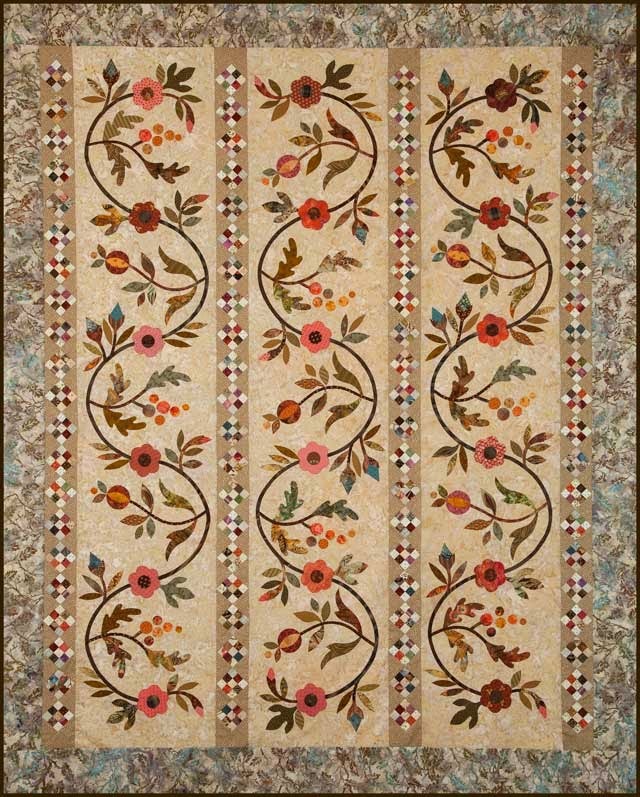 As you can see, there are columns of on-point 9-patches, which separate gorgeous columns of appliqued flowers. I thought that I would substitute my leftover hexie flower units for the on-point 9-patches and use the same fabric for the applique columns and the setting triangles in the hexie columns. 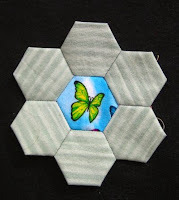 After doing some rough calculations, I determined that my hexie flowers were about twice as large as the 9-patches, so I'd need half as many units to make up the narrow columns. putting green hexie "leaves" on the flower units ... and finishing them off with black diamond side pieces. 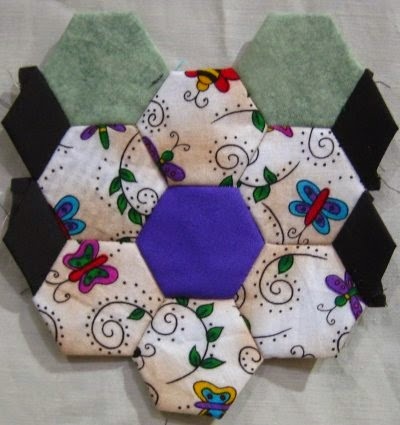 That's what I'm working on right now: sewing the 4 little black diamond pieces onto the sides of the hexie flower units. 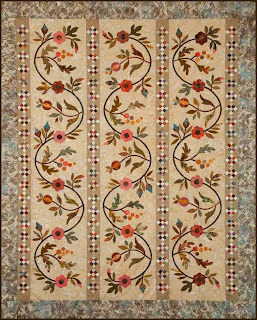 All the these hexie flowers will stack on top of each other to form the narrow columns that will separate the wider applique columns. Once all of flower units have their black diamonds, then I will work on constructing the columns of hexie flowers, trying to nicely distribute the colors. That's going to be the hardest part (for me): randomizing the hexie flower colors so it looks nice. Via the "magic" of some VERY basic photo editing, I've created a VERY rough idea of what the hexie flower column is going to look like. I have a confession to make: I have a twice-monthly indulgence .. a manicure. I love how pretty my nails look after my manicurist performs her magic on them. At my latest visit, she said that she was offering to all of her regular clients, a "kit" of manicure supplies that would be used exclusively for them. It consists of items that she normally uses: a nail file, a nail file block/buffer and a cuticle stick/orange stick ... but we would need to bring them back every time. I'm not entirely certain what prompted this but if it makes her job easier or satisfies some new regulation, I'm happy to oblige. BUT .. I know that I would be having a problem remembering to bring the items to every appointment without some sort of memory jogger. 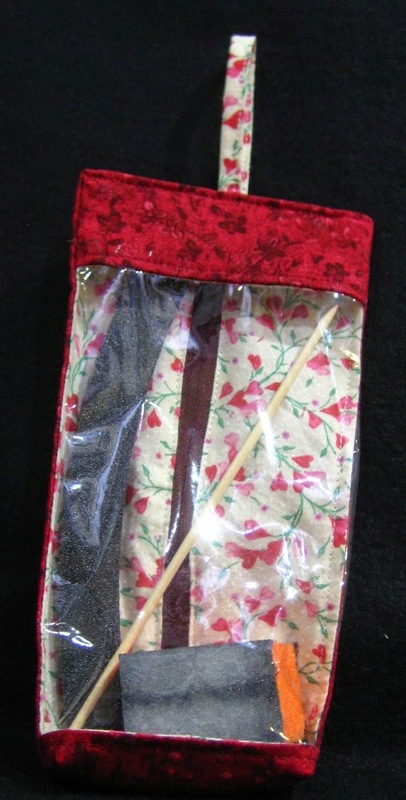 It occurred to me that if I made a little pouch for them .. with a window on one side so I could see the contents .. a zipper for easy access ... and put this pouch with my supply of nail polishes ...it would not only remind me to bring them but would be a classy way to transport them back and forth. PLUS, I could put my new nail color bottle in the pouch! So, I made a windowed zipper pouch. Very easy. It's simply a flat tube that I boxed on one end to accommodate the nail file block/buffer and put a hanging loop on the other end. All of the supplies fit nicely inside; I can see the contents and it's still big enough to hold a bottle of nail polish. 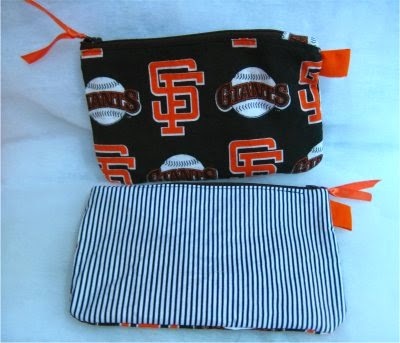 In addition to the SF Giants fabric to make a tote bag, I had enough leftover to make 3 zippered pouches. I made a windowed pouch as a companion to the tote bag. The tutorial for this bag is a PDF, available from Moda Fabrics and is called the "All You Need Bag". It's a very clever technique that incorporates two interior dividers so that you have 3 sections inside. The front features a clear vinyl window so that you an immediately see what you have inside that section. The dimensions, per the PDF, will yield approximately a 3"x5" little pouch ... obstensively just big enough to fit your ID/license, keys and some money ... so that if you need to make a quick trip to the corner store, all you'd need to do is grab this little pouch instead of your big, ol' purse. I chose to make my windowed zipper pouch bigger, to better accommodate the fabric pieces that I had. 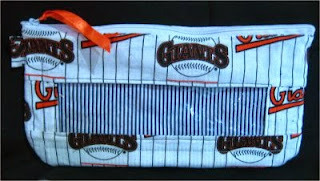 The front of the pouch is the black logo fabric and the reverse is black and white striped "umpire" fabric. 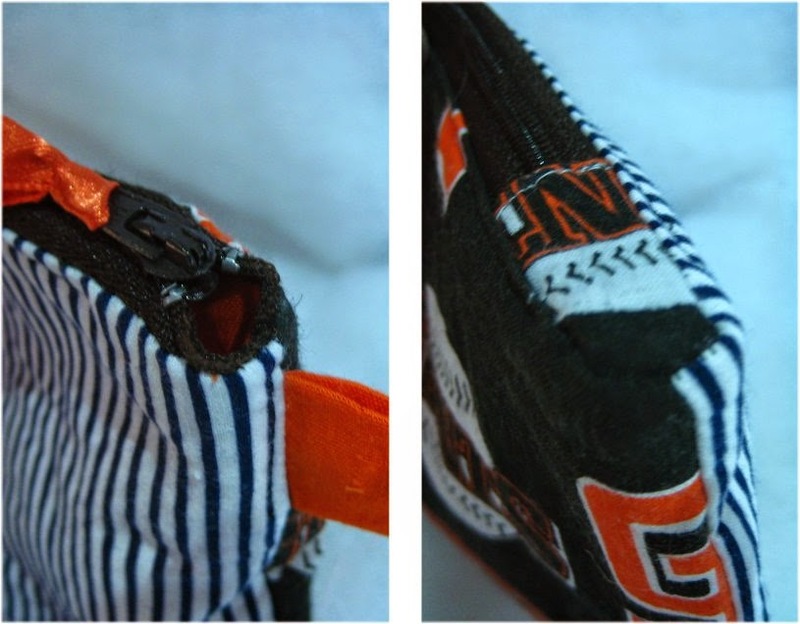 Both pouches have a bright orange zipper pull. They are a single compartment pouch. You can find tutorials for standard zippered pouches all over the internet, so I'll let you use your favorite. However, what REALLY bugs me about most zippered pouches are how the *ends* are so bunched up and UGLY. The term I've seen for this is "dented" .. and that's exactly what it is. The picture to the right is from the most excellent tutorial from Michelle Designs. Because my zippers were slightly smaller than the length of the pouch, I added a small piece of fabric to the end of the zipper to lengthen it. Here you can see both ends ... VERY neatly finished. They look so pretty! 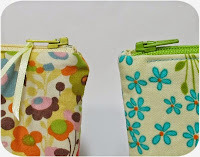 In fact, the technique used in the Michelle Designs tutorial is similar to that demonstrated by another most excellent zipper pouch tutorial, the Open Wide Zippered Pouch by Anna of Noodlehead. So, if you don't have a zippered pouch tutorial/pattern that you already like, go take a look at the Open Wide Zippered Pouch. Anna will guide you through 3 different sizes, all beautifully made and finished. Among some of the fabric that I acquired when my sister-in-law's mother died, was some SF Giants woven fabric. For whatever reason, I can find SF Giants and SF 49er fleece out here, but woven cotton is practically non-existent. So I was delighted to find these pieces in her stash. I searched through my collection of tote bag tutorials and chose my version of the Jordy Bag. This is a great tote bag, but over the years, I've added some extras that have proven to be very useful. 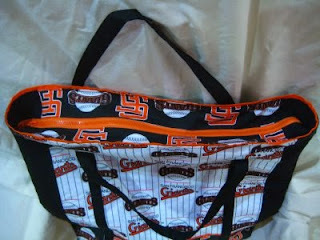 This specific bag is larger than the original Jordy Bag, as I wanted to maximize the use of the fabric that I had. The dimensions of this bag are a very generous 15"l x 17"h x 4"d.
I like to have an interior, hidden zippered pocket as well as a divided patch pocket. 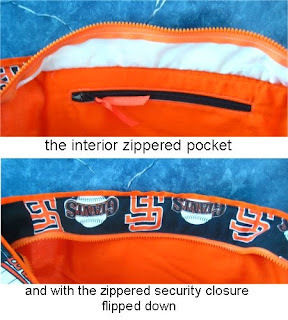 The lining is a bright SF Giants orange solid and the zipper is a contrast black. When the zippered security closure is flipped down, you can't even see that the hidden zipper pocket is there. What I like about this pocket is that the pocket itself hangs freely between the lining and the tote bag. It's securely made from interfaced fabric so there is no chance of it falling apart inside. It's a very ingenious design. On the other side of the tote, I put a divided patch pocket. It's nice to have an easily accessible pocket for small things. The inherent downside of patch pockets is that all the stress is at the top, where the pocket is stitched to the base fabric. Whenever you delve into the pocket, those stitches take the brunt of the pull. I put a patch of interfacing on the back of the lining so help support that stress, as well as stitching a triangle at the top of the patch pocket instead of a single line of stitching. But ... in the grand scheme of things, I expect this patch pocket to tear away at some future time. 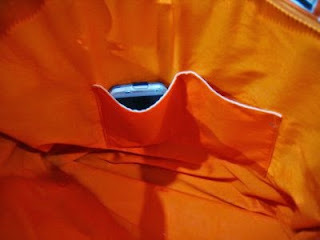 I like to have a zippered security top for tote bags ... although I have never been pick-pocketed, I am leery of having an open-topped tote bag in public. You just never know when a light-fingered individual is around. 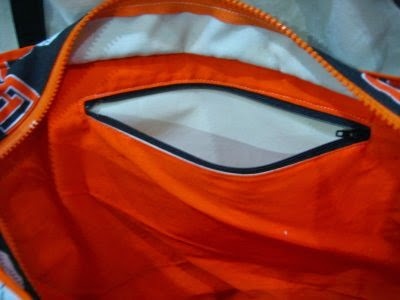 I chose a bright orange sport zipper to coordinate with the black background logo fabric. 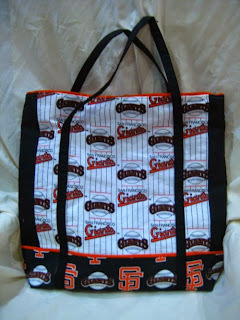 I also like to have the handles/straps fully surround the tote bag ... so that they start/end at the center bottom seam. Having fully supported handles like this enables you to carry heavier loads in the tote without being concerned that the stitches only at the top seam will pull out. Additionally, when the handles are sewn like this, you have a ready-made framework for an exterior patch pocket. Finally, I like to put a separate, removable firm false bottom in the tote. I'm still trying out various substances for the false bottom; this one is foam board. I cover the false bottom with the lining fabric and I put a piece of Velcro on the back side of the false bottom to match a piece on the bottom of the tote. That ensures that the false bottom sticks in place but can be removed when the tote is washed. The Jordy Bag is fully lined, which presents a beautifully finished interior, which is a lovely touch. 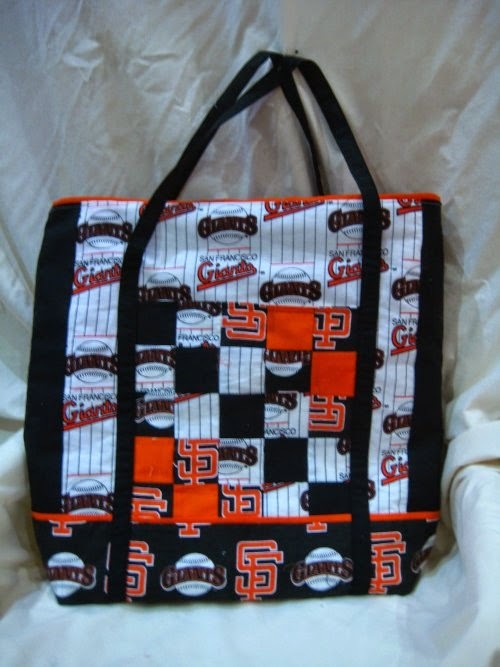 But as with many lined tote bags, the lining is a separate piece. This means when you fumble around the bottom of the bag, many times the lining will detach itself from the bag. This is annoying. I figured out an easy way to permanently and invisibly attach the lining to the bottom of the tote bag but still have a fully finished interior. When I made the Jordy Bag, I would make notes on the instructions, so I wouldn't need to think of how to do that feature again. I have incorporated those features into the instructions so that my version is sort of a mish-mash of different tutorials from various people. I figure, why reinvent the wheel when another sewer has already done the work? The tutorial for the original Jordy Bag can be found at Jordynn Mackenzie. 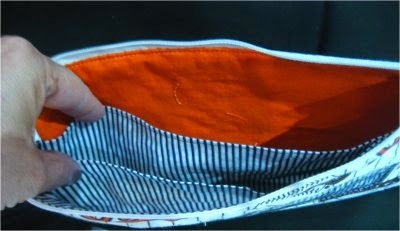 The tutorial for the interior, hidden zippered pocket can be found at Jerisew(s). 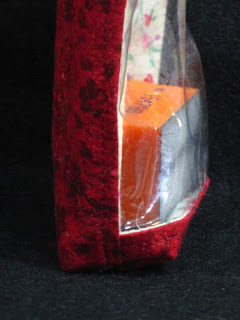 The tutorial for the zippered security closure at the top can be found at the forum at Craftster. The other variations are self-explanatory to any experienced sewer. I tend to want to wait until a quilt is finished in order to show off display what it is that I'm working on. But because I don't always quilt a top immediately upon completion of the piecing, it could be a LONG time until I blog about them. Then I remembered that showing a WIP is always appreciated, too. :-) So, with that in mind, here's what I've been working on lately. Earlier this year, my sister-in-law's mother, Audrey, died. Audrey & her family have been social friends with my family from when I was a little girl .... long before her daughter married my brother. So, there's a long time connection between our families. Audrey was a sewer. She and my Mom often made matching square dance dresses to wear to conventions and hoe downs. She collected fabric and "inventory" long before the concept of building a stash was made popular. She obviously had a great fondness for Christmas, both religious and secular. When she died, my sister-in-law and her sister asked me to help them clear out their Mom's sewing room. Neither of them sew or do crafts, so they have absolutely NO idea what would be worthwhile to save and what could safely be donated. They said that I could have whatever I liked, as whatever I didn't take would either go to the dumps or to donations. Let it not be said that I denied someone a helping hand. Especially when the payoff is fabric. :-) Nah, I would have done it even without the fabric. Originally, Audrey had organized her sewing room well. She had shelving around the walls with totes and cubbies on the shelves. But much later in life, she either gave up or became confused or didn't remember or didn't much care .. whatever .. because her purchases soon were simply tossed into the room. It took me over 6 hours just to clear out the center of the room, behind the door and the top of the sewing machine cabinet. I never even reached the shelving. Thankfully, it was all "stuff". No garbage. No little beasties. No bugs. I separated the fabric & notions & supplies that I could use, craft supplies that I would donate to our local elementary school, counted cross-stitch supplies to a kindergartener teacher who stitched. I boxed everything for ease of transport and filled up the back of our Jeep with all those boxes. And when I got home, I started putting all the fabric in the laundry. (I don't use anything that hasn't been washed .. personal preference). Remember me saying that Audrey liked Christmas? Well, her inventory of red & green Christmas fabrics totaled over 45 yards. Oy vey. I never did get around to figuring out how many yards of everything else, but it was at least that much. 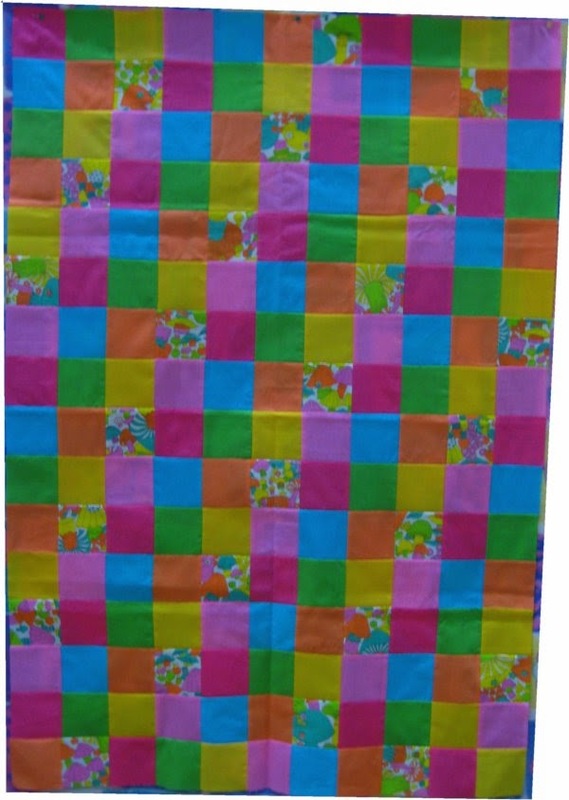 I also found 6 BRIGHT coordinating solids. 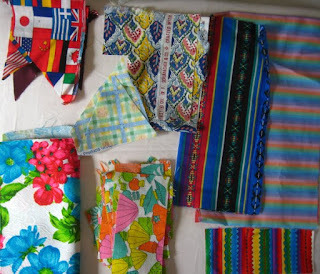 I had some fleece of my own that I had earmarked for quilt backings and was determined to use Audrey's bright scraps for the tops. 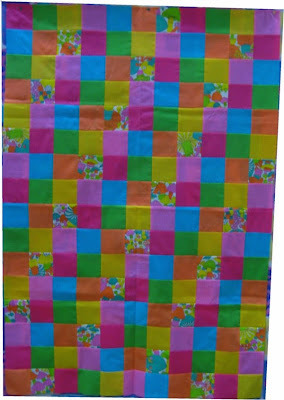 For the first top, I simply put the bright print squares and the 6 solids into rows, one following another. It was very repetitive but easy to sew together. Not terribly exciting but, boy, is it BRIGHT. I figure some little kid will be delighted with it. 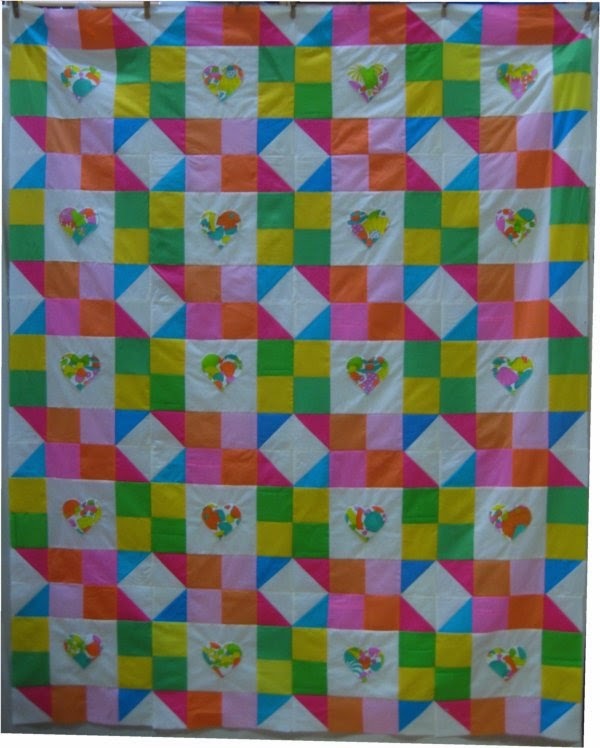 When the first top was done, I found I had quite a few bright print squares left over. This time, I looked through my collection of inspiration pictures and found something that caught my eye. 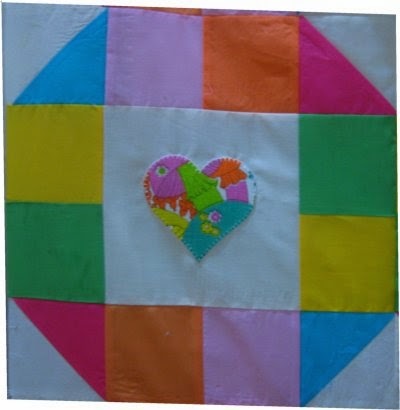 Using the 4" squares, this new layout would yield a 14" block with the BRIGHT print as a machine appliqued heart in the center. Eventually I made (20) 14" blocks for the second quilt. I found 3 other small pieces of fleece, that when sewn together, would produce a suitably sized backing. What is interesting is that when all those blocks were put together, the resultant top was such that you would never think that there was a basic block that started the whole thing. The fleece backings and the pieced tops have now been paired together and await their turn to be quilted. I had intended on loading the first quilt onto my longarm machine this past week, but before I could do so, a client called up to see if I could quilt something for him. Yep .. I sure could .. and Audrey's Brights will need to wait until the client quilt is done. 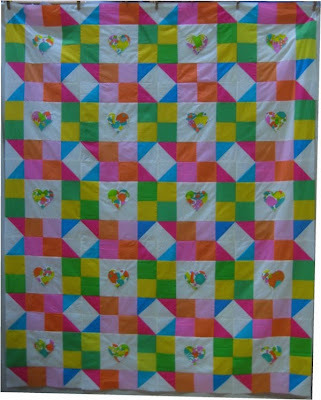 Luckily, there is no deadline for my donation quilts .. when I finish a "goodly amount", I bring them over, rather than transporting them onesie/twosies.